Anyone can join us online via Facebook Live from 8 a.m. to 5 p.m. EDT on Monday, June 11 for the Virtual Advocacy Forum. So, find those fuzzy slippers, a warm cup of coffee, and a big comfy couch as we bring you the 9th Annual AFSP Advocacy Forum. Virtual Forum participants will have the opportunity to engage with the event’s featured speakers and experts in the field of suicide prevention and mental health. Speakers include representatives from the Department of Veteran Affairs, the National Suicide Prevention Lifeline and the National Institute of Mental Health. They can then urge their two U.S. Senators and their U.S. Representative to make suicide prevention a national priority by emailing them through AFSP’s online Action Center. Virtual Forum registration will be open through 11:59 p.m. EDT on Sunday, June 10. 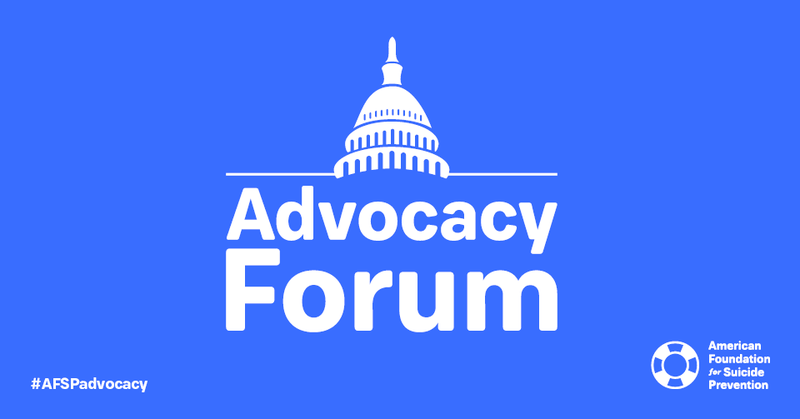 Registering early gives you exclusive access to Forum handouts and presentations, as well as a chance to win an in-person spot at our 2019 Advocacy Forum in Washington, D.C.